Five-year-old Maliyah Steadman was getting off her school bus in Shreveport, Louisiana when she was suddenly hit by a car. Even though the bus’s extended crossing arm was activated and it’s against the law, the driver went around the car directly in front of him that had stopped for the bus and hit Maliyah. In critical condition, the young girl was rushed to the hospital. Thankfully Maliyah was released three months later, but is still struggling with lasting effects of a brain injury. Stories don’t always turn out like Maliyah’s. Every year, an average of 131 kids die in school transportation tragedies. Most states have laws against passing stopped school buses, but people still ignore them. Currently, there are 15 states that have passed laws to put cameras on school buses and nine states have similar legislation pending. A study performed by American Traffic Solutions showed a 40 percent decrease in the number of violations once school bus cameras are in place. How can you make this happen in your town to protect your kids? 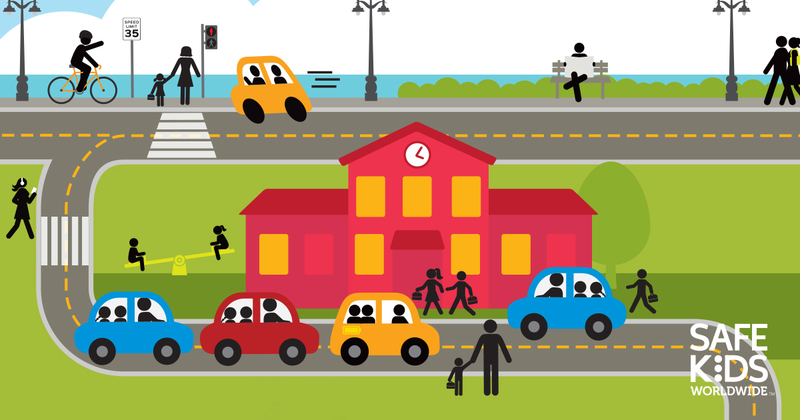 Safe Kids created a Take Action Toolkit: How to Fix an Unsafe School Zone to help make smart public policy and save lives in school zones. It starts with a virtual map of an imaginary school zone with six danger areas, such as a dysfunctional drop-off/pickup area, a street where drivers habitually speed or a spot where school bus passing is a problem. You can click on the school zone risk area that you think a change in policy or infrastructure could make safer. That will open up a very detailed but easy-to-follow action plan to start to make change. The action plans have model letters, sample social media posts, relevant facts and much more. You can go to the Stop School Bus Passing Action Plan and get to work. This toolkit has a model letter to invite people to a town hall to help build awareness of the school bus passing risk. It also has persuasive data and facts, ideas for potential allies you can contact and all the states that have current and pending legislation for cameras on school buses. It also comes with an outline for a bill on school bus cameras. Learn more about how to start a campaign for cameras on school buses in your state. If you have any questions, please reach out to the public policy team at agreen@safekids.org and areich@safekids.org. The Take Action Toolkit: How to Fix an Unsafe School Zone was proudly sponsored by FedEx.